The British Farriers and Blacksmiths Association (BFBA) looks after the interests of its members. Its head office is at Stoneleigh Park, Warwickshire, on the site to the National Agricultural Centre where it has an administrative office, a seminar room, a meeting room and a forge facility for competitions and workshops. The Executive Committee comprises of six farriers who meet regularly to promote the interests of the Association's members. BFBA also has a craft committee for farriery. BFBA offers its members a number of benefits including insurances, legal advice, discounts on vans as well as help and advice in cases of hardship or disciplinary procedures. The Farriers Registration Council (FRC) was established by the Farriers (Registration) Act 1975. It is an Act to prevent and avoid suffering by and cruelty to horses arising from the shoeing of horses by unskilled persons, to promote the proper shoeing of horses, to promote the training of farriers and shoeing smiths, to provide for the establishment of a Farriers Registration Council to register persons engaged in farriery and the shoeing of horses. To prohibit the shoeing by unqualified persons and for the purposes connected therewith. All practising farriers must be registered with the council, pay an annual retention fee and abide by a professional code of conduct. Lantra is the Sector Skills Council for the Farriery Industry. Our objective is to work in partnership with government and educational/training organisations to ensure that the skills and qualifications provided to the industry are working and are those that the industry demands. We have to work closely with Farriers to identify the business needs in order that we can shape policies, funding and learning provision for the benefit of all involved, promoting the importance of having a highly skilled and motivated workforce through training and development with the aim of increasing business productivity, sustainability - and ultimately profitability. 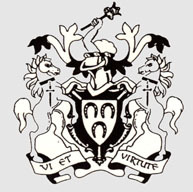 The Worshipful Company of Farriers is a City Livery Company which has its origins in 1356, when it was established as a Fellowship to oversee farriery within the cities of London and Westminster. Six and a half centuries later, the Company still has the responsibility for securing adequate standards of competence and conduct among persons engaged in the shoeing of horses. The company also actively promotes and encourages the art, science, training and education of farriery. Founded in 1605, the Worshipful Company of Farriers is number 55 on the register of the City of London Livery Companies.